Look stunning and feel amazing with the Body Bliss Cleanse. You’re only 10 days away from feeling better, restoring your confidence, and becoming your beautiful, bad girl self. Fall in love with the new you! Every day, your body is battling an ongoing war to keep you healthy by defending itself against illnesses and drawing toxins out of the body. The Body Bliss Cleanse is like calling in reinforcements. It empowers your natural ability to keep fighting the good fight by repairing existing damage and keeping you strong to fight another day. These days, most people are just too busy to eat right all the time and it’s not always possible to resist that second shot of tequilla. Unfortunately, our bad habits wreak havoc on our digestion, which means when we do finally eat right, our body can’t absorb the nutrients it needs. The Body Bliss Cleanse restores your body’s digestion, so you can get what you need from your food and get back out into the world. 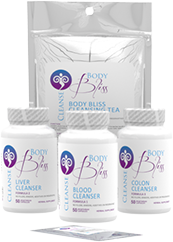 The Body Bliss Cleanse helps to eliminate toxins from all of your organs — even your skin! After just a few days, the Cleanse will pull the impurities from your skin, leaving you absolutely glowing. Most people on the Body Bliss Cleanse lose 5-15 pounds in just 10 days. No joke. "People ask me all the time how I stay energized and keep my body healthy. The answer is always the same. I eat right, exercise often, and cleanse my body. Body Bliss is the real deal. You’ll see!" and keep my body healthy. The answer is always the same. I eat right, exercise often, and cleanse my body. often, and cleanse my body. Body Bliss is the real deal. Your circulatory system is the piping that transports nutrients to your cells and toxins to the kidneys. This formula activates your body’s natural cleaning system by detoxifying your blood, lymph nodes, fat cells, and other tissues. Can help assist negative skin conditions. The Liver Cleanser stimulates the production of bile, which plays a major role in your digestion and helps to flush cholesterol, antibiotics, drugs, and other toxins from the liver and gallbladder. Strengthen and nourish your colon and intestinal tract to help your body form healthy stools and stimulate bowel movements. Sourced from willow bark, our activated charcoal powder can absorb metals, chemicals, and intestinal gases and eliminate them from the body. Our plant-based formula helps to purify the cells throughout the whole body. Very beneficial while cleansing. FIGHT FOR A BETTER YOU. MILK THISTLE, GINGER, DANDELION, FENUGREEK, BURDOCK, SENNA LEAVE, HAWTHORNE BERRIES, MULLEIN LEAF, JUNIPER BERRY, PEPPERMINT, STEVIA. ECHINACEA ANGUSTIFOLIA, BEET ROOT, DRAGONS BLOOD, SPIRULINA, KELP, DANDELION, BURDOCK, MANJISTHA, BITTER MELON, RED CLOVER, CHICKWEED, SASSAFRAS, AMALAKI, CLEAVERS, VIDANGA, CAYENNE, YELLOW DOCK, PAU D’ARCO, SARSAPARILLA, OLIVE LEAF, GOLDENSEAL. SENNA LEAVES, WHEAT GRASS, BARLEY GRASS, SLIPPERY ELM, BLACK PEPPER, CASCARA SAGRADA, CARBON (ACTIVATED CHARCOAL), BUCKTHORN, HARITAKI, TURMERIC, PSYLLIUM HUSK, IRISH MOSS, ALOE VERA, GINGER, CLAY BENTONITE, POKE ROOT, CAYENNE, FENNEL. MANJISTHA ROOT, ANANTAMUL, SCHIZANDRA, BEET ROOT, DANDENLION, BHUMYAMALAKI, ARTICHOKE, ROSEMARY, TURMERIC, LICORICE, BUPLEURUM, AMALAKI FRUIT, PIPPALI FRUIT, MILK THISTLE SEEDS, PEONY ROOT, BHRINGARAJ, RHUBARB, FENUGREEK, GOLDENSEAL. CARBON (residue of burnt plant matter from Willow bark).